Using the new 5th Edition Dungeon Master’s Guide from D&D, I created a dungeon in about 10 minutes. The book’s Appendix A might be my favorite part. In little more than 10 pages, it lays out random tables that allow you to create an entire dungeon – and stock that dungeon with monsters, treasure, traps and tricks – very quickly. 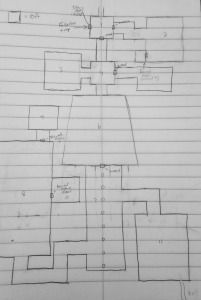 For starters, here is the map of the dungeon, which I determined would be an old temple. Pretty quickly, I rolled on a series of tables determining the sizes of chambers, the sizes of hallways, door types and chamber contents. There are also a series of tables for chamber purposes (based on what kind of dungeon you have), the state of the chamber, monsters, hazards, traps, obstacles, tricks, treasures, noises, furnishings and items. 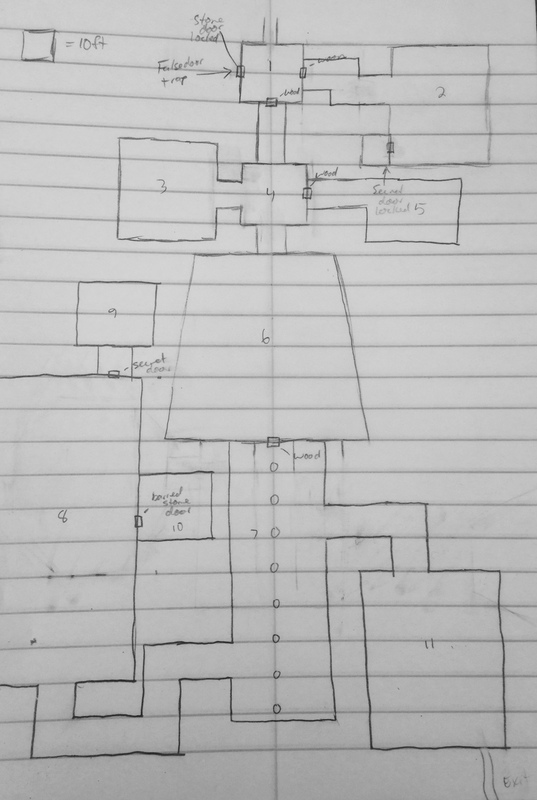 I numbered each chamber in a roughly top-to-bottom, left-to-right fashion and labeled the contents of each room. Let’s go room by room, shall we? Room 1 – A large dining room is the first room the characters enter. The room’s contents are water damaged. Room 2 – Through an unlocked, wooden door is a wide and winding chambers that leads to a conjuring room used to summon extra planar creatures. The room contains holy writings and some summoned monsters. A room in the corner contains a torture chamber that smells like urine. Room 3 – A temple used for rituals that’s full of spider-webs. The adventurers may find a dust of disappearance hidden under an altar. Room 4 – A smaller dining room for the temple’s high priests. It’s well furnished and has a rack of vestments against a far wall. Room 6 – This is a large banquet room used for celebrations and high holy days. It is in pristine condition, unlike the rest of the chamber. It contains a large monster, 3 expensive pieces of art worth 50 gp, a potion of healing and a potion of climbing. Room 8 – A very large workshop used to create religious items and weapons used for the temple’s clerics. It is occupied by a priest who has slain the others that were in the room before. He is attempting to conquer the temple and use it for his own purposes. Room 9 – Behind a secret door, this room is a robing room containing ceremonial outfits, a statue and a prayer rug. The rug animates when it is stepped on. Room 10 – Another room similar to room 9, this is locked behind a barred stone door. There are more prayer items in here. Room 11 – This is a crypt for the high priests of the temple. A glyph or warding warns the adventurers that it is heavily guarded. A trap of spears sit near a mural on the wall and the trap triggers if adventurers stop to study it. Monsters dominate this room. In it, adventurers find a secret path out of the temple, a spell scroll, a potion of invulnerability, magic arrows, an earth elemental gem and a potion of healing. Pretty simple. I love this because any DM in need of a quick dungeon could sketch this out before game night if they were pressed for time. OR they could create the dungeon in real time as the players explored.